Nearly every year the Tour de France makes its way through Ariège and this year finished on the Plateau de Beille - we rode up to watch and hiked across to Beille from an adjacent valley. What a fantastic day! 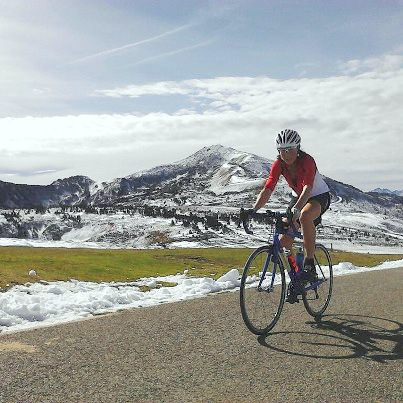 This is a superb location for road biking with some classic cols such as Col de Port, Agnès and Lers. Want to watch a race or take part in 2017? cyclotouriste 77km (1,000m +). Entry cost is between €41 and €47 depending on distance. There are a number of Tour de France cols to the west of Tarascon, for example the Col de Port, Col de Peguere to the NW, and the Port de Lers and Col d’Agnes to the SW. Circular routes to include these are obvious from the maps. They are mostly on good roads on wooded hillsides, except the Port de Lers from the south east, which is quite a narrow road – I found it best for ascending rather than descending. The summit is open with good views. To the north east, the land is gentler with shorter climbs, except for the pull up to Montsegur, the Cathar castle where hundreds of ‘heretics’ were massacred during the Catholic crusades of the 13th century. However to the south east, we found the land more varied but with equally challenging climbs. 1. Outline. The first is a 53 mile round trip from Ax les Thermes, taking in the Port de Pailheres, a 2001m monster with an amazing descent down the other side. The down is on single-track road for the first stack of hairpin bends. The route then drops into the steep-sided wooded Gorge de l’Aude, past an outpost Cathar castle perched improbably atop its limestone pinnacle. It then winds up out of the gorge to pass through more gentle pastoral land before meeting a larger road for the final pull up over the Col des Sept Freres and the Col de Chioula. You can then whiz down to Ax les Thermes and catch the train back to Tarascon after a coffee in a café in the little square, or take the winding Routes des Corniches, through little villages and past another castle high above the main valley, to bring you out onto the back road between Tarascon and Foix . Start from Ax Les Thermes (take the train from Tarascon, get a lift or cycle up the main road – not so much fun). Take the D613 out of the centre which heads straight up the hill with not much of a warm up! Take the right turn onto the D25 which heads up and over the Port de Pailheres at 2001m – the last 2 or 3km under the small ski village are the worst and just when your think you must be at the top, there’s a left hand bend and another stretch to the rocky, open plateau summit with fabulous views of the narrow hairpin bends, plummeting down the headwall of the dry wooded cirque on the other side. On the descent, the road eventually becomes easier and faster before you pass through a beautiful little mountain village called Mijanes where there are a couple of coffee stops. Follow the road down to the valley floor at Usson, where the castle is open to the public in the summer months, and where you meet the D118, which runs down the Gorges de l’Aude. Just down the road is a nice café by some fishing lakes. Turn left down the gorge and cycle for about 2-3km when you hang a left and then immediately right to head north on a minor road which winds up through limestone scenery, through a short tunnel (no lights needed) and over a low col at 1007m towards Aunat. Turn left in the village onto the D20, which leads across farm land through Rodome, and then drops abruptly into a pretty little gorge where the D20 meets the D107. Turn right down the D107 for about 1km and take the first left to leave the gorge behind and meet the D613 Quillan to Ax lesTherms road. Turn left to go towards Belcaire where we found a little supermarket to stock up on calories and much needed water. 2. Outline. This ride involves taking the excellent and inexpensive train (we caught one at about 8am) from Tarascon, over the Pyrenees water shed, to the south facing valleys on the border with Spain at Latour du Carol. From here, you wind your way through more arid hills to the high point in a smart ski village and then down to Monte Louise. Now your head north, up through open country and wide smooth roads to drop down into the never ending descent of the Gorge de l’Aude. You then broadly follow the first route but partly on different roads – we got to know the descent off the Col de Chioula well enough to improve our times by a good margin! Starting at Latour du Carol station, make your way SE to meet the main N20/E9 (it wasn’t busy at 8.45 on an autumn morning in October…) and follow it for 3km. Look out for a left turn in a village onto the D618. This winds its way (mostly) gently up for about 17km. There is a new road and roundabout just past a big supermarket near Egat – we kept to the higher, old road rather than taking the new road which went down, even though the signs seemed to indicate otherwise. This version of the D618 keeps winding up and eventually passes through quite a smart ski village. About 1km along, there is a roundabout, which is the high point at about 1750m. Continue on the D168 towards Monte Louise for a welcome whiz down on wide smooth roads. Just before you drop into the town, turn left onto the D118 towards Formigueres. The road climbs for about 5km to the minor Col de la Quillane at 1713m. From here, it’s all down hill for about 45km through the Gorge de l’Aude. Just before you drop down into the gorge, there is a lovely little village called Puyalador which has some excellent partisieres! Head down the gorge; it winds and falls through the wooded valley, past Usson castle and the café mentioned above. Leave the gorge after a second, ruined Cathar castle high on its rocky outcrop at Gesse, about 5km after the gorge turns east. Take the little D20 on the left at Gesse, which turns back west and climbs out of the gorge to give good views of the castle. Keep on the D20, through Aunat and Rodome to drop into the little gorge where you take a left turn onto the D107. The D107 winds through the limestone gorge proper and through the delightful village of Niort de Sault with its water fountain in front of the Marie. After the village, take a right turn to once again follow the D20 as it climbs on narrow roads (roughish for a short section) up through fields and forests for 11km to meet the main D613 at the Col des Sept Freres where you follow it as above back to Ax les Thermes. 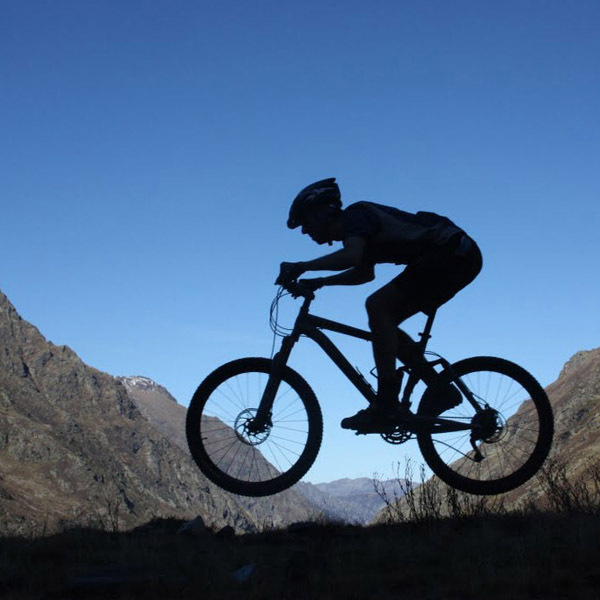 We offer mountain bike hire for 15 € per day and 65 € for the week. 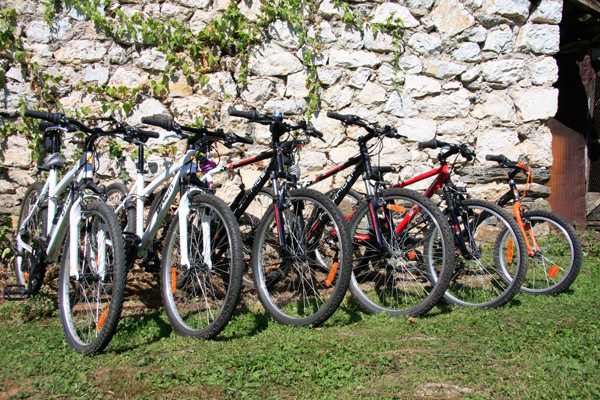 They are front suspension hard tail mountain bikes suitable for gentle off-road use. We have a range of sizes but request advance booking. If you need a performance road bike we can recommend a provider within 50km who can deliver.